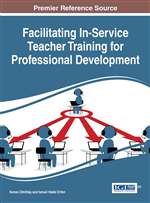 This chapter aims to present two action research case studies conducted in the English Language Schools of two universities in Turkey and discuss the long-term effects of this Professional Development activity on teachers' professional lives. In both of these studies, teachers were involved in collaborative action research. The first case study discusses a small scale collaborative Action Research project which targeted 16 English language teachers. Case Study Two, on the other hand, is a large scale project which explores 160 English language teachers' collaborative action research study. Detailed information about each case study is provided by highlighting the aims, institutional contexts, participant profiles, methodology used and findings. Teachers' perceptions about action research and the long-term impact of it on their professional growth are also discussed. Conclusion part highlights the factors that need to be taken into consideration while setting up collaborative action research projects in institutions. Finally, future research recommendations are made. Action Research, which is also known by other names like teacher research, classroom-based research, has been around for over 50 years. It was first introduced in the social sciences and was used in various fields such as industry, coal mining, business management. The use of action research in education dates back 1940s and it became very popular in the 1960s and 1970s.